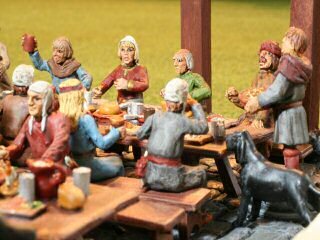 This article describes the painting of a 28 mm scale miniature Duke's Banquet scenefrom Mirliton.For those of you used to miniature historical armies or fantasy warriors, thisis not the type of figure you are used to.This 28 mm scale set of figures depicts an aspect of medieval life,a banquet given by some high ranking people to entertain their friendsand important acquaintances.For people used to miniature gaming, this might seem to be a strange set. "How do you game with these figures? "I know of no rules for medieval banquets or taverns, but I hopeto come up with some game rules for these figures one day.In the mean time, enjoy this museum quality slice-of-life from the middle ages,the kind of scenes that Mirliton is famous for. This banquet set is full of life.The head table guests include the opulent Duke and the Dutchess, and the Bishop.There are many entertainers: a jester, a costumed bird and cat person, and a 5 piece band with bagpipes,fiddle, tabor, and flutes.There are 17 diners and 2 servers carrying trays.Some of these diners are shared with the medieval tavern set,but there are 4 well-dressed ladies and 4 well-dressed noblemen to compliment the scene.Finally, there are 2 dogs of different breeds in the set although I have 3 in the photos because I borrowedone from the medieval tavern set. 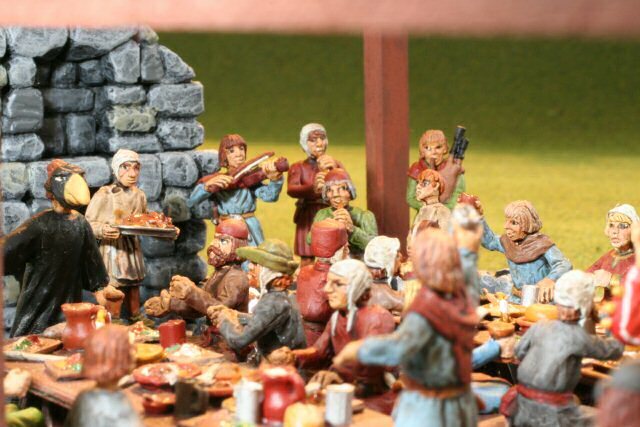 There are 3 large tables on covered in cloth to serve as the head table.The set comes with lots of interesting food and drink: cheeses, roast pigs, apples,trencher boards, serving dishes, utensils, breads.I found it easiest to prime and paint the tables and benches, and then glueall the tiny primed plates, cups, and utensils to the tables.Then once the glue dried I painted the plates and all food.There really is a lot of detail in the table settings.The seating includes a large head bench covered in cloth and 9 bench seats for all the patrons. The figures are placed in a partially completed scale building.It will be a meeting hall with two doors and two fire places, but at thistime I have just completed the foundation and the large timber frames.Some wattled walls and a removable thatch roof will complete the building one day.This banquet set also has some sconces and torches which I will permanently add tothe building timbers later on. Unfortunately, my banquet set was missing the legs for the last diner, so there are only 16 in the pictures here.The other legs are to be sent, but they did not show in time for my photos. 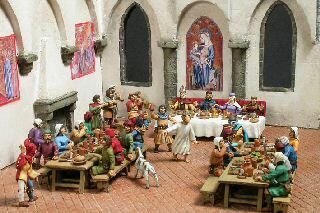 Here we see one of the large tables with its guests.The two women and the muffin capped man are unique to this set, but the otherpatrons are also included in the tavern set.The two dogs in this set are different breeds and sizes.Since I own a brown and a black dog, I had to paint the larger one black,even though the sculpture looks like a floppy-eared hound and should probably be brown. 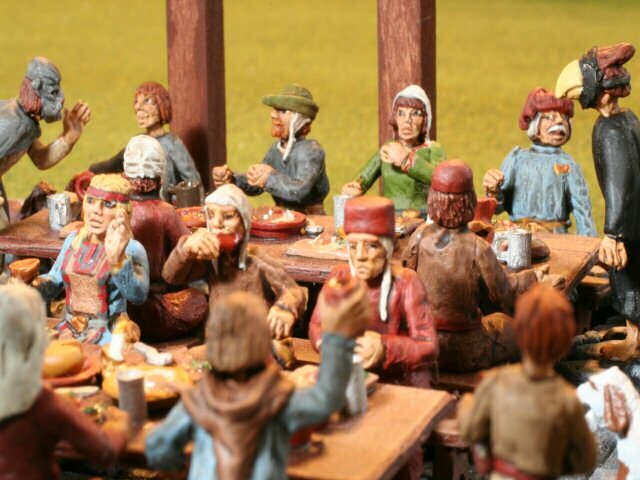 Here is the other large table with more characters.The women, the muffin capped man, and the pointed hunter capped man are interesting people in this set.The arms and torsos are separate so you can glue them together in differentposes, looking to the left or the right, arms at sides, on the table, or in the air. My favorite figures in this set are the entertainers.Here we see two of them in costume.One is in a cat costume and the other in a bird costume.I do not know if these have medieval banquet significance,or if others can provide a historical reference,but I imagine these folks walking around and telling jokes or performing magic actsto entertain the guests.The cat person sculpture has a very interesting pose as if just making a coin disappear and saying "ta da. "The bird person is painted in white tunic on the cover, but I have painted himas a crow to look like Drinky Crow, one of my favorite comic strip characters. In the back by the fireplace we see the band.There are a fiddler, a bagpiper, a boy with a tabor drum,and two flutists/pipers, one seated and one standing.I made a small stool for the seated flutist,since he will normally sit with the band and not at the tables.The stool was made from small bits of bass wood. 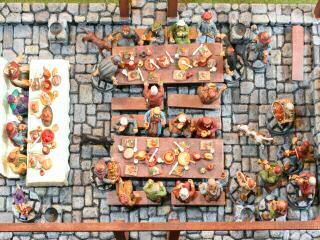 The server by the fireplace has a roast pig in his tray.Most of my figures are covered with Testor's Dullcote matte varnish.However most of the food, which is normally glossy and dripping withsauce or fat juices, is coated with some Liquitex Gloss Varnish.It is tough to see in the small photos, but most of the food is glossy. Here is an alternate paint scheme that appears on the Mirliton site.This painter (Grazzini Stefano?) has chosen lighter tables and different tunic colors.The scene has beautiful custom sculpted floors and wallsand wonderful frescos on the walls.See if you can spot all the difference between this artist's painting and myown painting in the other photos. Perhaps coming from my Dark Ages background, I tend to paint my clothing more drab.Other than the nobles at the head table, I have very simple earth colors onmy figures.Whatever you choose, the scene very readily becomes unique and interesting. 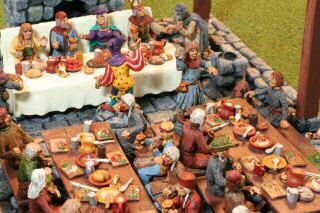 Here is an overhead view of all the figures in the Mirliton Duke's Banquet set.You can see just how busy the table settings and how many figures there are.There is plenty going on down there. The standing figures in this Mirliton kit have no molded bases.So I constructed resin bases to look like the floor.The figures are epoxied to the base using 6 minute epoxy which ismuch stronger than white glue or cyano-acrylate super glue. 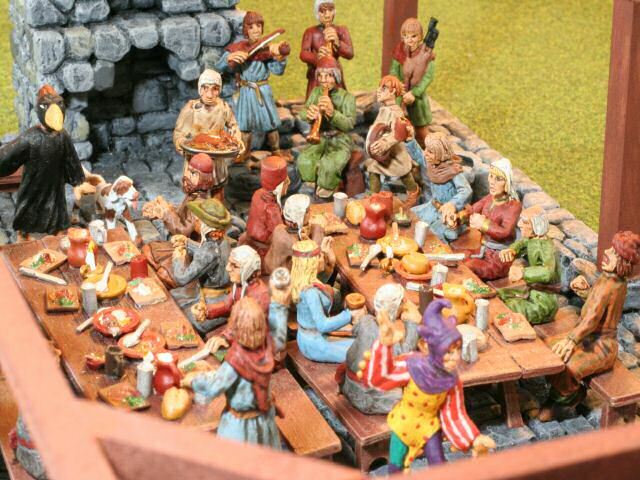 Thanks for visiting and reading about my Mirliton Tavern figures.I hope you enjoyed reading the details of making and painting them.If you have a similar kit, I would be interested in seeingyour version and the ideas you used to make the scene.More miniatures-related articles are atDan Becker's Miniatures and Models site. Last modified: Thursday, 09-Jun-2011 12:51:29 MST.